Be open to different interpretations of phrases. 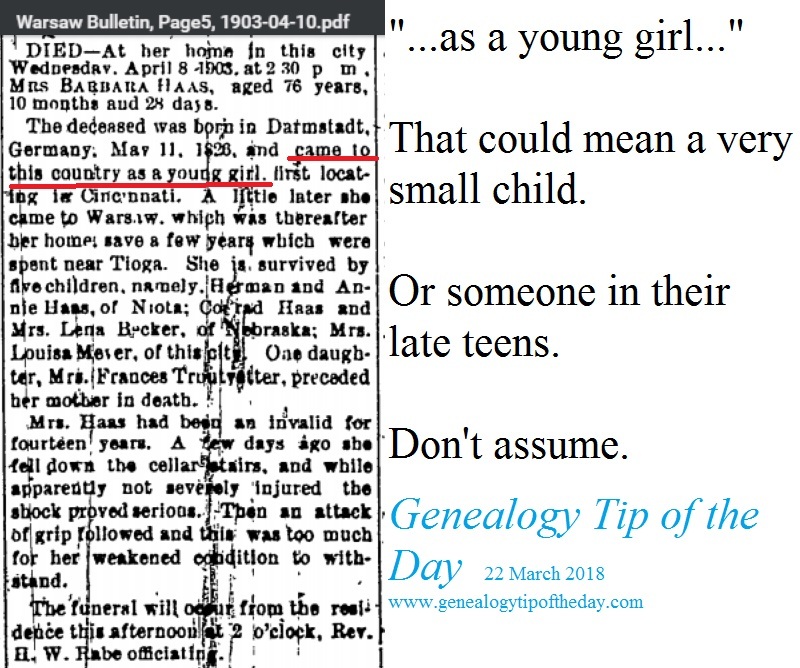 Barbara Haase’s 1903 obituary indicated she came to the United States as “a young girl.” Does this mean she was a toddler, a pre-teen, or nearly twenty? The newspaper could also be wrong about the “time” of her arrival as well. I shouldn’t use this phrase to make my searches of passenger lists overly narrow. And the failure to mention her parents doesn’t tell me anything about whether they immigrated or not. I certainly remember ur tip on a different issue but I have started going over information to see if there could be a difference in age in my brick wall. There have been because of some of the people mentioned were at a certain point in their life. So the person in doubt could not be the age I thought she was. Found information later confirming what u had said .At least I now have an idea on this. In Researching for Genealogical Information it has always been mentioned in all my Classes that in doing your Genealogy one never assumes. It stresses that one should always do a complete systematic, and “patient” study of all available sources and resources and there are many of them available (I find that Fast Genealogy is not good and Good Genealogy is not fast). One should thoroughly investigate all of this Knowledge and materials that is available and out there to be discovered and then sort them out to find the facts and principals needed to work with and then establish them to find a true and Factual Genealogy of one’s Family .